Description- Frankincense And Myrrh A valuable commodity of the ancient world for its religious and medicinal value, This fragrance embodies the classic and enchanting aromatic blend of frankincense and myrrh, with bergamot, patchouli and sandalwood. This fragrance oil is infused with natural essential oils including Bergamot, Coriander, Lemon, Orange, and Patchouli. Naturally Strong Scented Each spray/candle/wax melt creation relies on several hours of intense crafting in a process that utilizes many steps. Each step in the process brings us closer to completion with the final creation shown here. The last stop is of course your home or office. 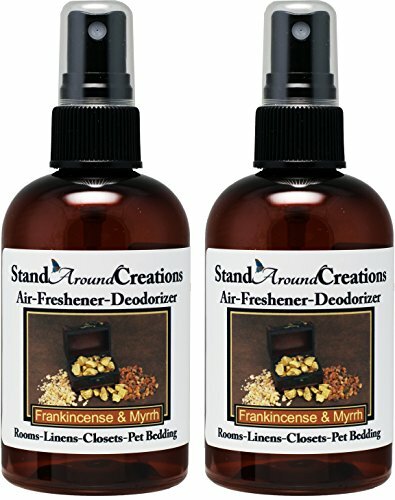 Leaving your home or office with wonderful natural scents lasting for hours. ----- Shipping: Items will be sent via USPS. Orders are filled Monday-Friday. 2-day shipping is available for an additional cost. Our offices are closed Saturday, Sunday and Holidays. Please allow 1 business day processing time. During warmer weather candles and tarts may soften as they are 100% Soy wax. This is normal. Simply allow your item to cool before use. No international shipping at this time. We do ship to Alaska, Puerto Rico, and Hawaii. ----- Cautions: Keep out of reach of children and pets.